We’re proud that we’ve been providing our extensive, impartial reviews for 3 years now. In this edition (Spring 2019), after testing several models, we concluded that the Coleman 6-Person Dome Tent with Screen Room | Evanston...is the best waterproof tent. Its sloped roof and well-designed rainfly kept us dry during the strongest storms. We loved the addition of the protected front porch on the Coleman 6-Person Dome Tent with Screen Room | Evanston...so that we could still sit outside even if it was pouring outside. The Evanston Screened Tent has a roomy 14 by-10 foot floor plan with a maximum height of 68 inches. We opted for the roominess of a six-person tent in case the weather keeps us inside. We considered an extra perk along with it being waterproof. The screened front porch and the sloped roof were the deciding factors for us. The well-designed rainfly kept the rain out while providing outstanding ventilation. It also has a mesh ceiling for stargazing on clear nights. To give our readers a choice of size, we included a smaller tent for those wanting those same features but in a smaller size. 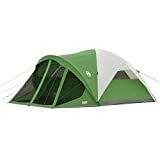 The Campla Camping Tent for Two Persons fits the bill completely like the Coleman Evanston Screened Tent for a larger group. The tent is primarily made of mesh panels and includes a full coverage rainfly. Our two honorable mentions are larger units for that welcome space when you’re stuck inside your tent. Both have excellent ventilation with the added benefit of a taller height for a more comfortable living space. They also have bathtub floors which we consider essential for a truly waterproof tent. 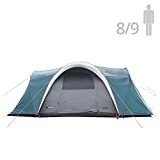 It’s easy to find a tent that is water resistant. That means it’ll keep you and your gear dry for light rain or moisture. A heavy downpour will test it to the extreme. 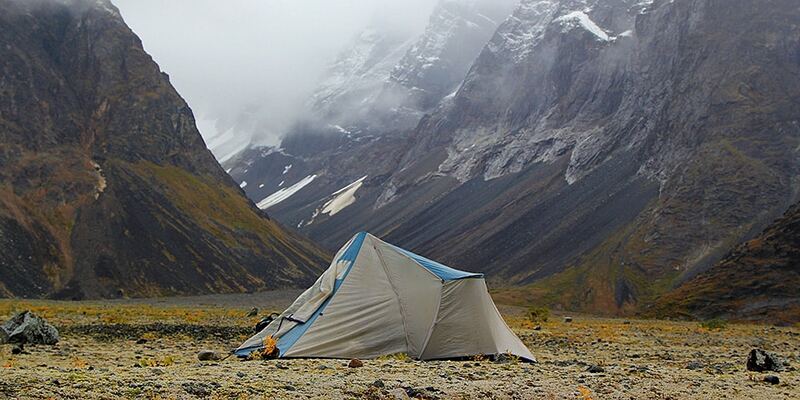 A waterproof tent can handle whatever storms come your way. Our guide will help you identify the features that mean a high-quality tent. Most tent descriptions will say a product is water resistant. It’s not a guarantee that things won’t get damp inside. However, certain features can help ensure that moisture doesn’t get in your tent. Taken as a whole, they will make it waterproof, so you needn’t worry about anything getting ruined or a poor night’s sleep. The shape of your tent can play a major role in keeping the inside dry. The two most common types are A-frame and dome. Each has their pros and cons. An A-frame tent will have vertical walls for the maximum headspace. However, the flatter roofs also mean water may pool on the top. If you prefer the extra height, look for an A-frame model that has a sloped roof. Dome tents don’t have that problem with water on the top since it’ll slide off the sides. They offer a distinct advantage over A-frame versions due to their superior wind stability. Wind will track up and over the dome to avoid damaging the tent walls. With an A-frame, it’s like a brick wall stopping the wind. And since strong winds often accompany rain, it’s an important point. The design of a tent can also influence the waterproof capability. The best tents for rain will include many of these features with modifications to improve water resistance. Remember, it is the combination of factors that makes the difference between a damp or dry tent. It’s essential to consider both the detail itself and any cons that it may have. 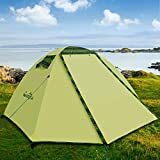 You’ll find tents that are either single or double walled. Single-wall tents have one layer of breathable and waterproof fabric. It’s critical that a tent description includes both words. A waterproof tent is of little value if condensation forms on the inside of the tent because moisture can’t escape. And it’s just as uncomfortable if it forms inside as if it came from outside the tent. Double-wall tents are more common. They will include a main structure that typically has one or more screen panels, depending on the seasonality of the tent. The purpose is to ensure adequate ventilation. With proper airflow, condensation will evaporate before it affects anything—or anyone—inside the tent. However, this feature is only as good as its rainfly. A rainfly gives you the best of both worlds. On clear nights, you can leave it off or just partially in place for stargazing or additional cooling. During rainy times, it’ll keep the inside dry while offering privacy. It’s essential that there is a gap between the tent roof and the rainfly to allow air to flow within the tent. The best waterproof tent will include this feature. Pay attention to the installation of the rainfly. Clip-on attachments make for a quick setup if you should get caught in a sudden rainstorm. 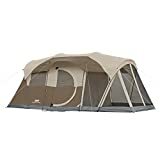 You’ll find rainflies that will partially cover the tent stopping midway down the sides or a full coverage unit. Make sure that all windows and doors are covered or at least sheltered from the elements. Having a waterproof tent will do you little good if you don’t have a place to store wet clothes or gear. A vestibule is your tent’s mudroom. It’s a place where you can take off dirty shoes or allow wet things to dry. It should have a covering overhead. Also, check to make sure that the sides are protected as it is or with the rainfly. You’ll find many proprietary technologies among manufacturers for ensuring a waterproof tent. 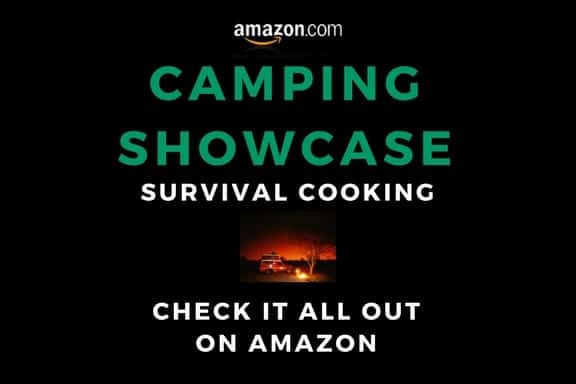 Some products include a bathtub floor which is simply an added layer of protection against water seeping into the tent. Look for a tent where it is several inches high to protect against blowing rain. There should be no gaps between the rainfly and the bathtub floor. Look for floors that are seamless for the optimal waterproof capability. The farther they extend up the sides, the better. Also, take a look at the zippers. Inverted style ones will offer an added layer of protection against leakage. Make sure the doors and windows close completely. Rubbing zippers with beeswax will ensure they open and close smoothly. Sealed seams are critical for the best tents for rain. These are points in the construction of the tent where water can get inside or where leaks may form. Most tents will have this feature straight from the factory. However, the smart camper will keep extra sealer and a tent repair kit on hand in case of a failure in the material. You’ll find tents described by the number of seasons for which they provide adequate shelter. Depending on the type, there are added features that you should consider. A 2-season tent is perfect for summer-only camping. They tend to have a lot of mesh so that optimal rainfly design is crucial. Look for solid construction in the frame. Three-season tents are similar to 2-season models with heavier construction to handle spring storms and strong winds. Four-season tents can handle snow and wintery conditions. They are usually dome tents to prevent accumulation on the roof that could damage a tent. They often have less mesh to keep the occupants warm in colder times of the year. The best tip we can give you is to be prepared for water seeping into your tent as a precaution. Keep clothes and outerwear off of the floor in case a window is left open, or wind forces rain into the tent. You might also consider laying a footprint or tarp on the ground before setting up your tent for added protection. Just make sure it’s less than the size of the bottom to prevent seepage. And with any tent purchase, we always recommend that you set it up at home first. Make sure you can quickly get the rainfly in place too. You may even want to consider doing a test run on a rainy night so that you can make sure there are no leaks. Finally, take advantage of the portability of a freestanding tent to move it depending on the wind direction.